New York, Jan 3 (IANS) United States President Donald Trump has stirred a diplomatic tempest by ridiculing India’s development efforts in Afghanistan and sources in New Delhi have rejected the volatile remarks by pointing out the importance of nation-building in the war-torn nation and asserting that it provides troops only for United Nations operations. 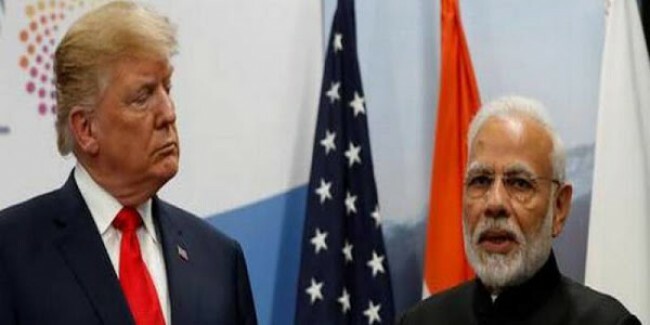 It was Trump, who had asked India in 2017 to play a greater role in Afghanistan, specifically in nation-building, but was now ignoring New Delhi’s economic assistance of over $3 billion since 2001, as well as its security assistance to the Kabul government. Dismissing Trump’s taunt, an Indian source in New Delhi said: “India firmly believes in the critical role that developmental assistance can play in transforming human lives. So far, India has not officially or formally reacted to Trump’s taunt. Trump appeared to be lashing out against criticism in the US and abroad against his decision to reduce by half the number of US troops in Afghanistan to 7,000 and India was caught in a context-less, free-wheeling diatribe. This and his decision to pull out of Syria sparked the resignation of Defence Secretary Jim Mattis. Under Trump, the US has moved for closer strategic ties with India, giving it the status of a major defence partner and entering into several security-related agreements. But Trump has frequently attacked close US allies. Trump’s statement was made in the context of what he said the US efforts abroad to protect global security interests and what he perceived as inadequate investments by other countries in these efforts. His remarks appeared to be a criticism of India for not providing troops for US-led operations in Afghanistan, but it ignores New Delhi’s security assistance to that country that includes training for over over 4,000 Afghan military and security personnel and supply of helicopters. Soon after 9/11 attacks by the Taliban-backed al-Qaeda in 2001, the government of then-Prime Minister Atal Bihari Vajpayee had reportedly offered logistical and security support for the US operations against the Taliban and the al-Qaeda. But it was reportedly rejected by then-President George W Bush, who chose to rely on Pakistan, which in turn double-crossed Washington by harbouring al-Qaeda leader Osama Bin Laden and supporting Taliban forces that attacked US troops in Afghanistan. Trump has, however, added a caveat that he got along well with Modi, who he said is “smart”. “I could give you an example where I get along very well with India and Prime Minister Modi,” Trump was quoted as saying. India’s package of of the $3-plus-billion developmental and humanitarian assistance to Afghanistan includes the Parliament house, the Taliban has tried to destroy as it is a powerful symbol of democracy. Scores of Indian workers have paid with their lives for helping rebuild Afghanistan in the face of terrorist attacks. India has built strategically important network of roads in Afghanistan with potential for use by US and NATO forces there. Acknowledging India’s role in providing strategic alternative links to Pakistani ports for Afghanistan, the US exempted Indian Chabahar port project in Iran from US sanctions against dealings with Tehran. The port is linked by an India-built road to Afghanistan that was used to transport 1.1 million tonnes of wheat donated by India to Afghanistan. Pointing out that India plays a significant role as a development partner in Afghanistan, the sources here said this partnership was built on the specific needs and requirements worked out with the Afghan government. “It is aimed at the welfare of the people of Afghanistan and for a tangible improvement in the lives of its people,” the Indian source said in response to Trump’s crticism. “India seeks to build capacities and capabilities of Afghan nationals and its institutions for governance and delivery of public service, develop socio-economic infrastructure, secure lives and promote livelihood,” the source added. Other Indian projects include the 220kV DC transmission line from Pul-e-Khumri to Kabul, a 220/110/20 kV sub-station at Chimtala, and the Salma Dam with an installed capacity of 42MW. Also, over 3,500 Afghans are undergoing various training programmes in India. Each year New Delhi gives 1,000 scholarships for Afghan nationals under the Indian Council for Cultural Relations (ICCR) and provides 500 Indian Technical and Economic Cooperation (ITEC) slots for Afghanistan. India has also built the 400-bed Indira Gandhi Institute of Child Health (IGICH) hospital that also trains health personnel. India encourages private investment in Afghanistan besides community development projects including in education, health, agriculture, irrigation, drinking water, renewable energy, flood control, micro-hydropower, sports infrastructure and administrative infrastructure.